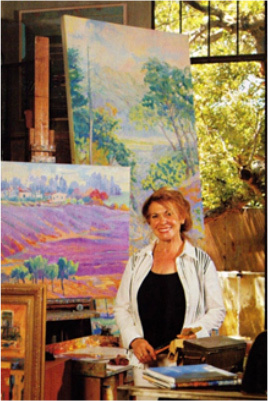 Maria del Carmen Calvo, based out of Capistrano Beach, California, is an artist and fine art painter who has used the medium of oil paints to explore a variety of subjects that have captured her artistic soul. Subjects include images from her native Spain, Europe and the United States, her adopted country. The outstanding artists of Spain have always had a unique, artistic viewpoint that, although rooted in tradition, defies classification as a particular school of thought. Inspired by the beauty and traditions of Northern Spain, Maria del Carmen Calvo began her artistic journey early in life. Her approach is to observe and record the tensions within the rhythms and balances of nature in both a structural and tonal sense. She has a unique instinct for mood and a solid sense of composition and design. Above all, Calvo has a distinct feeling for the dynamics of color. The result is a live and moving canvas, painted freely with vigor and strength. Ms. Calvo studied at the Academy of Bellas Artes in Madrid, Spain, as well as in France and the United States. She has achieved international success with both art critics and private collectors and has been the recipient of many awards.